Ed. 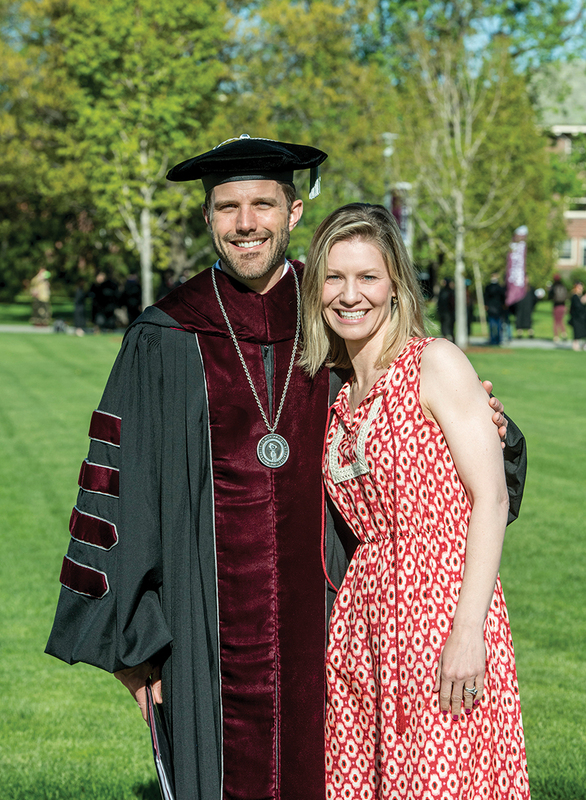 Note: Seth Bodnar was appointed as the new president of the University of Montana this year. He is the 19th person to hold that position. Mr. Bodnar graduated first in his class at West Point, was a Rhodes and Truman scholar, and has two Masters’ degrees from the University of Oxford. He served as an assistant professor at West Point. A former Green Beret, his immediate past employment was as a senior executive at General Electric, where he was responsible for long-term business strategy at GE Transportation. Your selection as the new president was somewhat unusual given your largely non-academic background. How does your former work experience apply to the demands of a public university? Throughout my career, I’ve had the opportunity to lead organizations in complex and dynamic environments. While a university is undoubtedly different from a military or business unit, the ability to lead through change and uncertainty is essential to success for university presidents in today’s environment. Like any leader, a university president has to develop a clear understanding of the strengths of her or his institution and then work to apply those strengths to the greatest opportunities and societal needs. But most importantly, a university president has to work in a spirit of shared governance to help the institution, and everyone who works there, reach their full potential. You speak of this year being a “defining moment” for U of M, rather than a “critical juncture,” as it has been described in the past. Why the distinction? I call this a “defining moment” for our university because it reminds us that we, along with our students, must take hold of our future, define our distinction as a university, and ensure its vibrancy for centuries to come. Since becoming UM President, I have been asking the question, “What does the world need in a university today and how do we most effectively meet the needs of our students and the state of Montana?” The University of Montana must shape educated, creative, lifelong learners, unlock opportunity and social mobility, and advance the frontiers of knowledge through research and creative scholarship. To do this, we must be the agile learners that we ask our students to be. What are your top priorities for the university over the next 5 years? I remind our community how fortunate we are to be at the University of Montana at this moment in time, realizing that we are one link in a very long chain. The land where our campus sits today is the aboriginal territory of the Salish land and Kalispell people. For more than 125 years, the University of Montana has offered excellent, affordable, and accessible education. The job of those of us here at UM now is to ensure it remains vibrant and relevant for the next 125 years. Clearly, enrollment is a priority at UM. We are looking at ways to better support students and help them persist to graduation. We are promoting internships and experiential learning as an important component in preparing students for success after graduation. The University of Montana is a great place to work. Our employees, from faculty and staff to contract professionals and students, are an integral part of our success. I want them to feel appreciated for the work they are doing now, but also to know that this university is prepared to help them with professional development and pursuing other opportunities as well. Do those priorities also reflect a long-term vision for the university? Absolutely. Our long-term vision is, in many ways, the same as it was on our original charter. We exist first to provide our students with a broad, interdisciplinary, and high-quality education. At the same time, we’re working to help UM contribute to the economic growth and quality of life for our community. How will you seek to overcome budget shortfalls in the near term? We have a plan to address our structural budget deficit over the next four years through a combination of reducing costs and increasing revenues while enhancing the quality of the education we provide our students. Budget shortfalls always pose challenges, but they also provide the impetus for creative and innovative thinking. You appear to have strong feelings about the need for “diversity.” Can you summarize what diversity means in the context of a university education? The benefits to our students, our employees, and our state cannot be overstated: having a diverse student body, faculty members, and employees brings a wealth of different beliefs, perspectives and insights to our collective learning. As a person from a small, rural town, my worldview prior to attending college was quite limited. But the opportunity during college—and later in graduate school overseas—to study and work with people from different backgrounds enriched my education in ways that I never could have imagined. I want to make sure we do the same for students at UM. Enrollment at the U of M has been stagnant to downtrending over the past few years. What is your plan to increase enrollment of both in-state and out-of-state students? We are focused on two key areas related to enrollment at UM: bringing new students to campus and helping those who are already here to persist and succeed to graduation. We need to seize opportunities to tell our story and engage with prospective students, beginning in their freshman year of high school. We are increasing our investments in this area, and I recently announced an organization restructure to bring our marketing and enrollment efforts together under one leader, which will improve coordination and execution of our efforts. Perhaps more importantly, we are working hard to ensure that every student who shows up here at UM succeeds to graduation and beyond. We are working to better understand why students leave before completing their degree and exploring ways in which we can help them persist and succeed. For example, we know that helping students build meaningful connections here on campus is important, and we’ve found that participation in a freshman seminar course or our freshman wilderness experience offered through campus recreation can help students build friendships and connections that will serve as an important support system for their first year and beyond. Do you see the U of M in competition with Montana State for student enrollment? Montana students are incredibly fortunate to have a strong Montana University System and excellent options for pursuing their post-secondary education. I want every student to attend the place within the system that will provide them with the best education within their areas of interest and passion. I am also excited about exploring collaborative opportunities with campuses across the Montana University System. How will you connect with the student body in terms that are meaningful to them? I love to engage with our students; they are the reason UM exists! I am continually impressed by their passion, intelligence, commitment, and engagement across our campus. Whenever I can, I am out on the campus talking to students. Engaging with our students challenges me as well; I get to see UM from their perspective and hear their ideas. Okay, Seth Bodnar off-duty. What do you most enjoy during your free time, and what “Montana” experiences do you look forward to? Above all else, I’m a husband and father, and what little free time I have these days, I try to spend with my wife, Chelsea, and our three children. Chelsea is a 5th generation Montanan, so I have been coming to Montana with her for many years, and we feel so blessed to be here and enjoying the wonderful aspects of Missoula, such as hiking the M, attending cultural events around town, and making new friends. Our whole crew is looking forward this summer to enjoying the many splendors of this great state!